Speech Keyboard is the default method by which text may be entered into a text field using the HMT-1 or HMT-1Z1. Whenever a text entry screen is brought into focus or selected, the hands-free keyboard is displayed automatically. You may speak the phonetic commands for letters either individually or as a group. For instance, you could enter one character at a time by saying ‘ROMEO’, then saying ‘ECHO’ once the ‘R’ character has registered, or you could enter an as many letters as is needed with one command. EXAMPLE: Saying “ROMEO ECHO ALPHA LIMA WHISKEY ECHO ALPHA ROMEO” in one breath without break will enter ‘realwear’ into the text field. 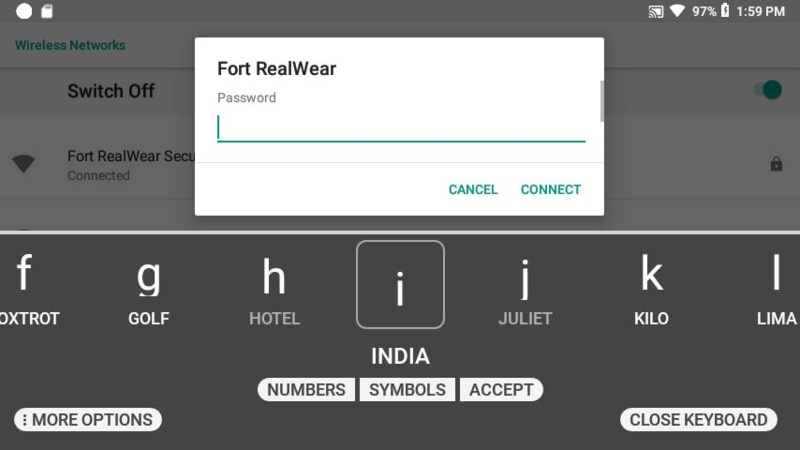 When a password field is selected, the Secure Entry keyboard appears. This means that phonetic speech commands are disabled, and the user instead uses head movements, left or right, to highlight a character. The user then says ‘Select’ to make a selection. Saying the command ‘SCAN CODE’ opens the barcode reader and allows the user to scan a QR Code for remote keyboard entry using the RealWear Companion app on a mobile phone. This is convenient for passwords and long strings of text. Simply open the RealWear Companion app, select ‘Remote Keyboard’, enter text and tap on the QR Code. From the HMT keyboard say ‘SCAN CODE’, then scan the QR Code visible on the screen of your smartphone. You can also access the ‘SCAN CODE’ option by saying ‘MORE OPTIONS’. For Speech-to-Text entry, say ‘Dictation’, then immediately begin speaking freely. Dictation is cloud-based for all languages, so an internet connection may be required. Some languages support local dictation as well. You can also access the ‘DICTATION’ option by saying ‘MORE OPTIONS’. For more information, please visit www.realwear.com/support. NOTE: If the keyboard becomes hidden or accidentally closed, use the “SELECT ITEM #” command to select the text field again and the speech keyboard will reappear. If entering a password for WiFi authentication, simply say “PASSWORD” to activate the speech keyboard. To set the zoom level for clear scanning say “Zoom level 1-5”. For example, to set the zoom level to 3, say “Zoom level 3”. “DICTATION” Activates dictation and allows user to enter text based on speech recognition. “ACCEPT” Accepts the entered information and navigates to the next screen in sequence. “SPACEBAR” Inserts a single space. “BACKSPACE” Deletes the last character. “CLEAR TEXT” Clears the text in the Input box.